TEHRAN, Iran (CNN) -- A defiant and chaotic protest sprouted in and around a public square Monday despite a warning by Iran's Revolutionary Guard against the kind of street demonstrations that have roiled Iran for more than a week, witnesses said. 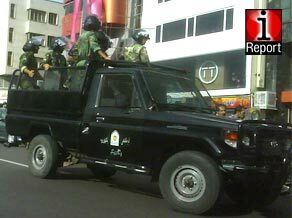 Security forces patrol the streets of Tehran on Monday. Thousands of Iranians congregated and passed through Haft-e Tir Square, but riot police and the pro-government Basij militia confronted them and smacked their batons against their shin guards, making loud cracking sounds that seemed like gunshots, the witnesses said. As the protests continued, an election official with the Interior Ministry said the "box-by-box details" of the ballots -- which were confidential in previous elections -- would be released in response to claims that the election was rigged, Press TV reported. Iran's Guardian Council declared President Mahmoud Ahmadinejad the winner of the election with 62.63 percent of the vote. His closest rival, Mir Hossein Moussavi, received 33.75 percent, surprising many experts who expected him to win. Iranians have continued protesting the results by taking to the streets. Most stores around the square were closed as the unrest reverberated, with some guarding against damage by erecting steel fences on their windows. Helicopters hovered overhead as the security forces wielded batons and used a spray to push the crowd out of the square. After that, police chased down demonstrators in nearby alleys and streets, with protesters and lawmen playing cat and mouse over several tension-filled hours until the crowd began to thin out around dusk. There were isolated face-offs and quarrels that broke out between demonstrators and the riot police and the Basij militia -- a volunteer paramilitary force that takes orders from the Revolutionary Guard, a military unit under the direct control of Iran's supreme leader. There were no reports of serious injuries, but there were at least eight arrests, witnesses said. "Thirty years after the revolution, this is what we get," one man said dejectedly, watching the noisy and chaotic scene as he remembered the birth and the promise of Iran's Islamic revolution in 1979. The location was the spot where a vigil was to be held in memory of Neda, a young woman who became a symbol for the opposition after her death was caught on camera. While Internet postings on Twitter, Facebook and an Iranian opposition leader's Web site had mentioned a possible rally, it was unclear whether people who were at the square were there for a vigil. Meanwhile, a message on opposition leader Mir Hossein Moussavi's Facebook page, which could not be authenticated, called for a peaceful demonstration in Tehran on Thursday to honor the dead. "We are waiting for the route of the march to be announced as well as the location of the sit-in," the message said. "Presently the mausoleum of the founder of the Islamic Republic seems to be the safest place for the sit-in, so that we can mourn for our martyrs in a place that is close to the spirit of that free man. Demonstrators Monday had brushed off a warning from the Revolutionary Guard that people who "disturb the peace and stand up to security forces" would be met with a strong response. The state-run Islamic Republic News Agency quoted the Revolutionary Guard as saying "the guardians of the Islamic revolution and the courageous Basiji together with the security forces following the orders of the supreme leader and following him unquestioningly." It said the authorities "are determined to act strongly to return peace and tranquility to society ... and to clean the country of these plotters and hooligans." Iran's Revolutionary Guard is directly under the control of Supreme Leader Ayatollah Ali Khamenei and enforces the government's Islamic codes and morality. With more than 200,000 members, it is tasked with overseeing the country's crucial interests, including guarding its oil fields and missile arsenals. The regime's lawmakers called for a review of ties with Britain amid concerns over so-called Western "meddling" in the country's daily unrest. The government-funded Press TV reported that Iranian lawmakers were calling for a review of the country's ties with Britain because of its "interference in Iran's recent post-election unrest." Britain's Foreign Office announced Monday it is withdrawing the family members of its embassy staff from Iran until the situation there improves. News coverage in Iran has been limited by government restrictions on international journalists. On Sunday, the BBC said Iran had expelled Jon Leyne, the British network's permanent correspondent in Tehran. Al-Arabiya, a Dubai-based Arab satellite network, said its Tehran bureau was ordered closed. At least 19 people were killed in clashes in Tehran on Saturday as Iranians took to the streets to protest the results of the June 12 presidential election, according to hospital sources. On Monday, the site was intermittently inaccessible, but said at one point that Moussavi had met with a group of clerics in the city of Ghom on Monday morning to discuss current events. A spokesman for the Guardian Council told state television that Wednesday is the last day it can recount the votes disputed by candidates.